Though the US has warned the pact between India and Russia could attract sanctions under the US law, the BJP-led government still decided to go ahead with the $5-billion deal. The Triumf missile deal with Russia will give India's military a much-needed boost, which would act as a deterrent against China's growing presence in the region and a superior edge over Pakistan. The S-400 Triumf missiles are extremely efficient to track and hunt down combat aircraft, even stealth planes, at unprecedented ranges. As per Reuters, the United States has warned countries trading with Russia's defence and intelligence sectors they would face automatic sanctions under a sweeping legislation called Countering America's Adversaries Through Sanctions Act (CAATSA) that President Donald Trump signed into law last August. The law is designed to punish Putin for the 2014 annexation of Crimea from Ukraine, "involvement" in the Syrian civil war and alleged "meddling" in the 2016 US presidential election. But Defence Minister Nirmala Sitharaman had earlier said: "Negotiation on S-400 air defence systems has been on for a long while and it is at a stage where it can be finalised," she said, adding that "We (Russia and India) have a big legacy of buying defence equipment from Russia." Though Russia was the major supplier (around 80 per cent) of arms and ammunition to India during the Cold War, greater ties with the US shifted the focus towards the West. Now India has imported around $15 billion of arms from the US in the past 10 years. However, the improving ties between India and Russia could hit its relation with the US, say experts. Meanwhile, tweeting the pictures of the two leaders, Raveesh Kumar, Ministry of External Affairs spokesperson, said: "A relationship radiating warmth and affection! PM @narendramodi welcomed @KremlinRussia_E Vladimir Putin for the 19th India-Russia Annual Bilateral Summit continuing the series of fruitful engagements this year!". 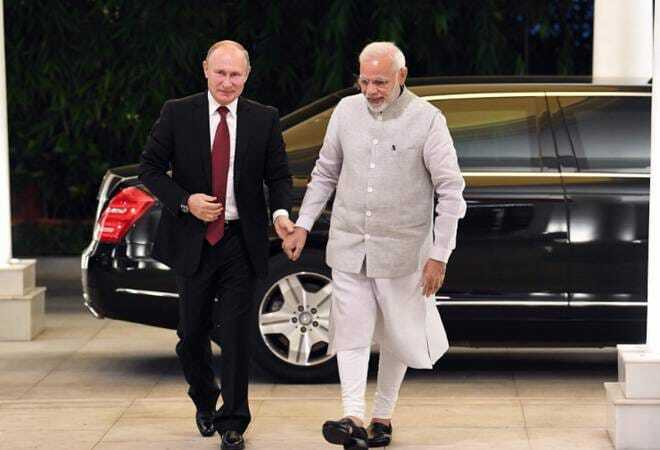 Earlier on Thursday, PM Modi welcomed Putin, tweeting: "I look forward to our negotiations, which will undoubtedly strengthen the friendship between India and Russia." Putin was accompanied by a high-level delegation, including Deputy Prime Minister Yuri Borisov, Foreign Minister Sergey Lavrov and Trade and Industry Minister Denis Manturov. He will leave for Russia later during the day.